Florida Republicans return to a tried-and-true strategy, portraying Democrats as big-government liberals. ORLANDO — The leaders of the Republican Party ticket in Florida, Gov. Rick Scott and Rep. Ron DeSantis, blasted their Democratic rivals Thursday as radical socialists who can't be trusted with the reins of government. 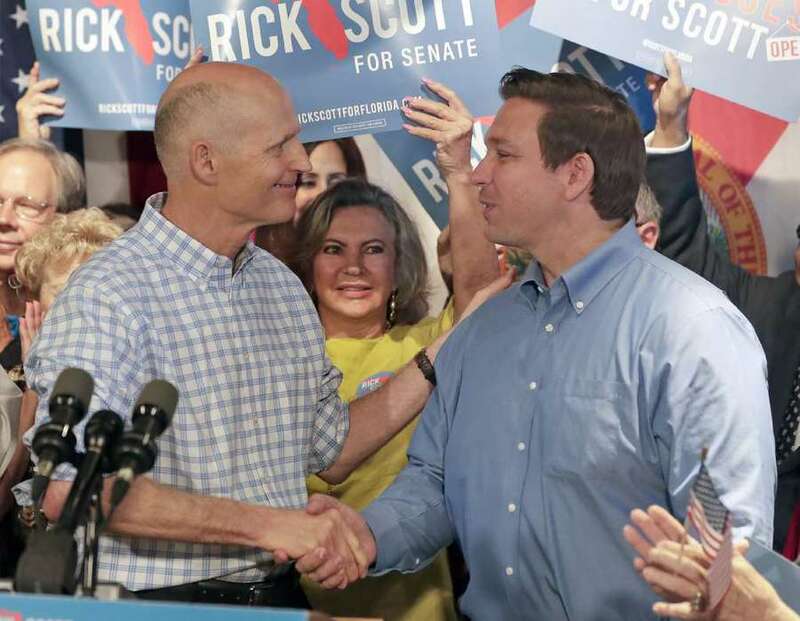 At a barbecue restaurant in the heart of the I-4 corridor in Orlando, Scott and DeSantis appeared together publicly for the first time since they won their respective nominations for U.S. Senate and governor in the Aug. 28 primary. Their strategy was a tried and true reflection of past Republican political campaigns in Florida, portraying Democrats as liberal advocates of more taxes and spending who can't be trusted. Republicans have won the past five elections for governor over a 20-year span in Florida. The last Democrat who won was Lawton Chiles in 1994. "This election offers voters the starkest choice possible," Scott said, reading from a prepared text — a rarity for him. "The Democratic ticket of Bill Nelson and Andrew Gillum offers a very clear, very liberal, very radical and very risky direction for our state and country." Scott's speech highlighted the Republican strategy of linking the moderate Nelson to the more liberal Gillum at every opportunity. In his speech, Scott compared Gillum's agenda — Medicare for All, increasing the corporate tax rate from 5.5. percent to 7.75 percent and raising the minimum wage from $8.25 to $15 an hour — to socialism, which is essentially the state takeover of businesses, in Cuba and Venezuela. The Republican event came a week after a Democratic pep rally in the same city, at a union hall where Democrats sought to team Nelson's pragmatism and Gillum's idealism into a rare mix of energy and excitement that can produce a pair of November victories. Despite Scott's massive personal wealth — he spent nearly $100 million of his money in his two campaigns for governor — Scott cast himself as a poor child of working-class parents who grew up in public housing, and said that Nelson "grew up wealthy." Nelson grew up in a middle-class household in Florida. Scott's net worth grew by $83 million last year to $232 million, according to a financial statement filed with the state. Nelson's net worth is between $1.3 million and $6 million, according to a statement filed with the Senate. Also appearing as members of the Republican ticket were Tampa lawyer and former Hillsborough circuit judge Ashley Moody, the GOP nominee for state attorney general; Chief Financial Officer Jimmy Patronis; and Rep. Matt Caldwell of Lehigh Acres, GOP nominee for agriculture commissioner. DeSantis, whose principal political asset is an endorsement from President Donald Trump, defended ICE, the Immigration and Customs Enforcement agency, and he accused Gillum of favoring a policy that protects child molesters. "If somebody's in our state illegally and they molest a kid, and they get convicted and they serve a sentence," DeSantis said, "when it comes time for them to be released when they've served their sentence, you do two things: Either they're given to immigration authorities and repatriated back to their home country, which is what I think should happen, or if you're Andrew Gillum and you will not cooperate, you have to release those people back into our society. Well, guess what? A convicted child molester will re-offend. So you are putting our communities in danger." Hecklers interrupted Scott's speech a few times, and Republicans quickly tried to drown them out with chants of "U-S-A! U-S-A!" Nuñez, with DeSantis alongside, faced reporters briefly afterward and downplayed her past criticism of Trump as a “con man” and as a supporter of the Ku Klux Klan in the 2016 presidential campaign, when she supported her friend and long-time ally in Miami politics, Sen. Marco Rubio. Norma Reno, a retired Tampa lawyer and a native of Venezuela, held a Rick Scott campaign sign at the GOP rally in Orlando. "I think it's going to be close but he's going to win," Reno said. "He has done an incredible job working for the Hispanics, and he's against Communism, which is very important to us." Scott later met Vice President Mike Pence, who traveled to Florida to stump for the governor. Pence was scheduled to appear at two fundraising events for Scott in Orlando and at The Villages, the sprawling three-county retirement haven and home to many older Republican voters.